Every Year on the 3th Tuesday in September the Netherlands celebrate Prince’s Day. 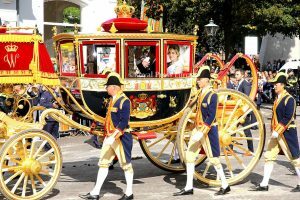 Prince’s Day is the Day on which the reigning Monarch of the Netherlands addresses a joint session of the Dutch Senate and House of Representatives, to give the Speech from the Throne (Dutch: Troonrede). Also the proposal of the next year’s budget. 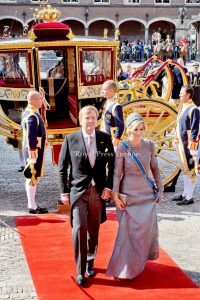 The Dutch King is Willem Alexander and his wife Queen Maxima. On the Balcony we see King Willem Alexander, his wife Queen Maxima and princess Laurentien Brinkhorst, the wife of Prince Constantijn, the youngest brother of King Willem Alexander of the Netherlands.